I have just returned to Paris after ten days in Japan, a short stay but one that opened my eyes to a few things about the expat experience. First, a warning. Anyone who lives in Japan or knows it well is probably going to groan a lot in the next few minutes, so forgive me – this was my first visit, and impressions are bound to be superficial. Even moreso because I went there not knowing anything substantial about the culture or the language. I speak fluent French, decent German, bad but occasionally understandable Spanish, pick and mix Italian and, on a clear day with the wind in the right direction, I can make out what the Dutch, the Swedes, the Flemish, Catalans and even Rumanians are saying in their newspapers, but my brain has problems latching on to any language beyond these germano-latin building blocks, so I was a caricature of the idiot tourist. Nevertheless, a ten-day trip to Japan gave me a lot of insights into European culture. Yes you did read the end of that sentence right. First of all, why are we so impolite? In Paris, if you go into a café, you can spend five minutes thinking you’re invisible. In Munich recently, I watched waiters ignoring my attempts at eye contact and then frantic waving, only to go and grab one and learn that I was sitting in an area of seating that wasn’t open in the daytime. Danke schön. In Japan, the second my friend and I stepped inside any eating or drinking establishment, we were greeted by someone who showed us to a table and gave us little wet towels to wash our hands. These weren’t touristy watering holes or luxury hotels. Sometimes they were little more than cafeterias. In smaller places, everyone including the sushi chefs said a loud welcome. I’m assume they weren’t all shouting “tourist alert – hide the whalemeat”. The ticket inspectors on the bullet trains even give a general bow as they leave each carriage. I can just imagine the national strike that would break out if France’s railways tried to get their staff to do that. I do realize that this ever-present bowing is a lot like the over-friendliness of American waiters and waitresses. The Japanese waitresses didn’t think we were returning Samurai. It is simply part of their life to bow to each other. The Japanese might hate, scorn or want to ignore their fellow citizens, but when face-to-face they show respect, at least outwardly. Even so, in both Tokyo and Kyoto this respect for other people was so ingrained that most bicycles I saw parked in the street weren’t locked. (I checked). In Paris, an unlocked bike will disappear before the rider has got off the saddle. A locked one too, if it looks at all resellable. Again, this is only a superficial view and I may be missing deep veins of disrespect running through Japanese society, but it seems to say a lot about a place if only the really expensive, trendy bikes are locked up. The incredible patience shown by the poor people who had to endure our ignorance when confronted by menus was equally revealing. OK, in France you might come across a friendly waiter who will spend five minutes explaining things to someone who doesn’t understand anything he’s saying, while other more literate customers wait to be served, but you’d be very lucky. Japanese menus often have pictures to help you, though these aren’t always helpful. A bowl of noodles is a bit like an ocean – you don’t always know what’s lurking below the surface. And as a fish-eating vegetarian, I wanted to make sure. The guidebooks give you “helpful” phrases but I’ve learnt to my expense that going into a restaurant and announcing “I’m a vegetarian” usually causes more panic than it’s worth. It’s much better to ask what is in something and work from there. And in Japan, with a bit of negotiation, a lot of mime, a few key words and a hell of a lot of tolerance from the poor waiting staff, the results were usually delicious. This knack of making people feel welcome extended still further. Several times in the street, when we were doing our “I’m lost/confused/jet-lagged” act, people came up and asked, in English, “Can I help you?” Admittedly they might just have wanted the chance to practise their English – and they often didn’t know the answers to our questions, which was embarrassing for all concerned. But it was a gesture that you don’t always get in Europe. A few of these volunteers were ex-pats taking pity on poor tourists, which made me think that the Japanese attitude might well have rubbed off on them. Here in Paris, I honestly think that most expats seeing a lost tourist gazing at their map or guide book would think “huh, tourist” and keep walking, or at the very least assume “they’ve got a guide book, they’ll work it out”. 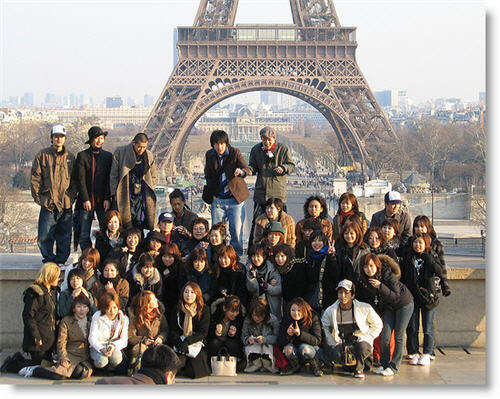 Perhaps the Japanese are mirror images of my long-term hosts, the Parisians. I always tell people that if you pierce even the most obstructive-looking Parisian’s armour with a “bonjour” then they can be friendly, welcoming and helpful in ways you didn’t even realize you needed. Maybe the Japanese are polite, patient and respectful on the outside but impossible to deal with beyond that. I somehow doubt it. Expat life must be fairly comfortable, day-to-day, simply because of this climate of general pleasantness. Sure, you’re never going to be accepted as Japanese, but that’s only to be expected. And we expats in France are never truly accepted as French, either. You can become a Parisian, but you’ll always be different. Deep down, despite my grammatical French, I am still suspected of having burnt Joan of Arc and laughed at De Gaulle’s large nose. Japan hinted at complications below the surface – their habit of ignoring north on street maps and printing them at any random angle suggests a way of thinking that isn’t all that compatible with, for example, France’s rigid scientific approach to geography and life in general. An expat would need to get into that mindframe, I expect, in order to work with people who don’t need their diagrams to be held the right way up. But that’s the same anywhere. If you don’t think like a Parisian in Paris you’ll sink. The slavish way English is used everywhere, even in texts that are aimed exclusively at the Japanese, felt flattering to a Brit, as if we’re somehow cool. Though I once saw a menu with headings “food”, “soft drinks”, “alcohol” and the list below each English word only in Japanese. And the neon bar signs in Tokyo, often for establishments where (so everyone says) foreigners are not welcome for once, were the same. One said “Girls Bar, safari park experience”. Pole dancing on giraffe’s necks? Ah yes, this business, much discussed in the guide books, of small Japanese bars and restaurants not welcoming foreigners. I think it often has nothing to do with racism, or even wanting to stay free of lager loutism. We went in a couple of these places that had no more than four or six seats. And we realized why they might not “welcome” foreigners (although they did, in each case). If you sit on one of those four or six stools, you’re probably going to take the place of a regular. In one bar, we were asked to move along the bar to make room for a man who arrived and clearly sat in the same place every night. One tiny restaurant in Kyoto was obviously a neighbours’ home-from-home. By chance, an English teacher was having dinner, and introduced his fellow diners – a divorced man from across the road, a divorced lady, and a couple of friends from across town. The hostess was a kind of surrogate mother and did a little set menu every night. She patiently picked out the bits that I could eat, and then one of the neighbours called for sake all round. There was slow but friendly conversation, and the hostess went and got her shamisen (three stringed banjo) and gave us a song about the moonlight shining on the river (no, not the Andy Williams one). The English teacher even bought my book A Year in the Merde on line. Not welcoming to foreigners, you say? Stephen Clarke’s latest novel, The Merde Factor, the misadventures of an expat Brit in Paris, is out now, published by Century. Buy it on Amazon here.